Without the friendship of a remarkable Indian the settlement at the forks of the Red and the Assiniboine rivers could not have been established as early as 1812. Chief Peguis was born in 1774 near Sault Ste. Marie and originally the spelling of his name was Begwa-is (he-who-cuts-into-the-beaver-house). When a young man he lead a group of Saulteaux to the Red river and occupied the territory about Netley Creek where the Red flows into Lake Winnipeg. He and four other chiefs claimed authority over all the Red River Valley, and when he became aware of the great rivalry between the two fur-trading companies, Peguis foresaw trouble and warned the Indians against taking sides. He was a man of great oratorical gifts and strength, and quite handsome in spite of the loss of part of his nose-bitten off in a fight when he was young. He wore his shiny black hair in two long braids studded with bits of brass, a breechcloth, cotton shirt, red leggings and a blanket. When he wished to impress others of his colour with his power he donned his feathered war-bonnet and fringed tunic,and, dashing his knife into the ground, cried that was how he would deal with all transgressors. He watched the arrival of the first white settlers. He watched too the mounting determination of the North-West Company to rid the country of them, and repeatedly warned the Hudson's Bay Governor of pending trouble. Then at five o'clock on the afternoon of June 19, 1816 Governor Semple and 21 men were massacred near a cluster of seven oak trees midway between Fort Douglas and the farms. Their cabins were burned, their crops destroyed and their cattle killed. The survivors fled in panic taking their families in canoes northward down the Red river to safety. While Chief Peguis gazed sorrowfully at the desolation, he was criticized and berated by an officer of the Nor-Westers for his sympathetic attitude towards the settlers - "You Indians should have joined forces with us to drive them off your land!" The following year Lord Selkirk arrived to re-establish his Colony and to make a treaty with the Indians. He was attracted by Chief Peguis' many fine qualities and in recognition of his friendliness to the defenceless settlers, presented him with a large silver medal and a much prized scarlet coat. Lord Selkirk placed the Saulteaux first on the treaty although the Crees had been here long before them. Peguis and his four friends placed their mark on the treaty - a rough drawing of the animal that signified their private totem, or coat-of-arms. Peguis' drawing resembles a large wolf. Lord Selkirk also wrote a letter of recommendation which read in part - "a steady friend of the settlement since its first establishment - often exerted his influence to restore peace and having rendered most essential service to the settlers in their distresses deserves to be treated with favour and distinction by the officers of the Company and by all friends of peace and good order." When the refugees - who had camped all winter at Norway House - returned to the Forks at Lord Selkirk's behest, Peguis greeted them with gifts of fish and wild rice, and through the many lean years to follow before prosperity came to the farmers he provided buffalo-meat for them. Jokingly he referred to himself as the Colony Chief. His band took up permanent residence at the place we know as St. Peters and very quickly learned the dates of Scottish festivities and journeyed to Kildonan on these occasions to celebrate. Exactly one year to the day of signing the treaty with Lord Selkirk, Peguis led 34 canoes filled with Indians to the fort to claim the promised 100 pounds of tobacco. His closest white friend was the Reverend William Cochrane, the Anglican missionary who in 1826 built a small cabin and church at the rapids - now Lockport - where the portage was ideally suited for a church. When the Chief asked to be admitted into the church Cochrane refused on the grounds that he could not baptize any man who had four wives and who came reeling home from Kildonan full of liquor. Finally in 1838, after the dismissal of three wives and two-years of total abstinence, which he never broke, Peguis was accepted into the Christian faith. To crown this happy event, Cochrane presented his friend with a large Bible which is now in the Provincial Library in Winnipeg. In gratitude for his ability to keep his band from becoming involved in native warfare he was honoured as no other Indian ever was. He was invited to travel with Sir George Simpson to York Factory and Norway House when the great Councils were held at these forta. He dined at their tables and took part in their discussions, taking his place with all the Chief Factors from the principal trading-posts. Chief Peguis died in his 90th year on Sept. 28, 1864, and the most humble and the most notable figures in the land gathered for his funeral. Two archdeacons presided at his burial in the church-yard at St. Peters. 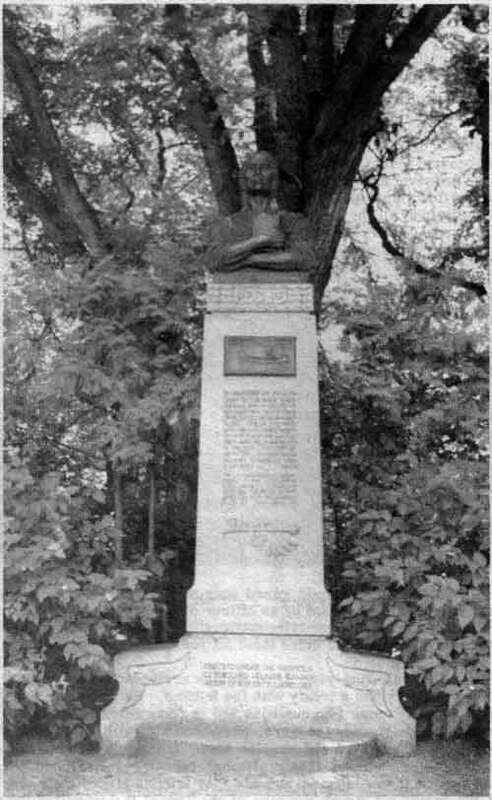 On May 24th, 1924 a tall red granite shaft topped by a likeness of Chief Peguis was erected in Kildonan Park where he had so often visited the early settlers, bearing his gifts of buffalo meat and constant loyalty.